Everyone loves a good laugh, and laughter is good for Internet business. You heard me right. It’s time to take humor seriously. Even Hollywood – happy with ticket receipts, but slow to honor the art – has tipped its hat to laughs and given the romantic comedy Silver Lining Playbook an Oscar nomination for Best Picture. Take these comedic cues and sell your brand with laughter if you want to win the gold. The Bluths are coming! The Bluths are coming! Coming back that is. 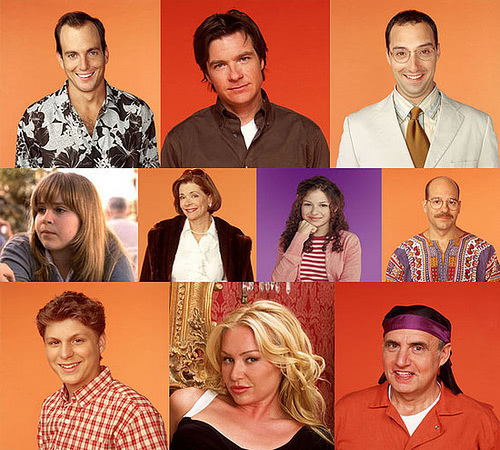 As of May 7th, the cult favorite Arrested Development returns for a 4th season exclusively on Netflix. Netflix could have gone a number of ways to kick-off their exclusive content production. After customer relation snafus, wrangling to legalize sharing with Facebook, many would argue the company needs a sure hit. I’m no business soothsayer, but I know the AR release will force my to reactivate my dormant membership. Win over customers with chuckles. Edward Norton’s charity-themed, crowd-fundraising platform Crowdrise scored a major success with its Mozilla Firefox Challenge. Over 1,700 donations brought in more than a million dollars. 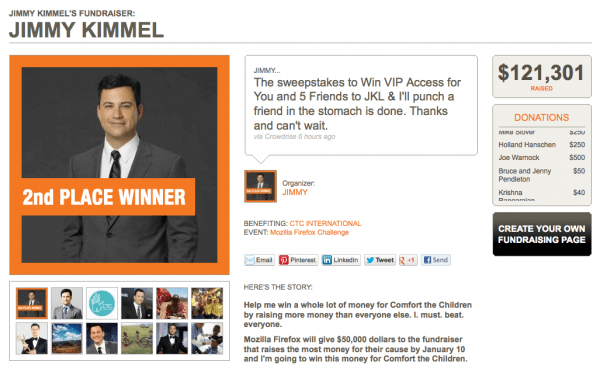 Celebs offered donors a chance to win prizes by making contributions to various causes. Among the most popular crowd-tempting prizes were Jimmy Kimmel’s offer to punch a friend in the stomach (on behalf of Comfort the Children), Seth Rogen’s signed ukulele (Hilarity for Charity, battling Alzheimer’s) and Will Ferrell’s signed cowbell (Cancer For College). Mozilla donated $50,000 to the winning charity – The Ian Somerhalder Foundation, and the 50 Shades of Gray author gave a copy of his book with a signed note. Well done Mozilla, performers, donors, and crowdfunding platform. We gotta have more cowbell! So if you want to kill ‘em, offer something that will tickle the funny bone. 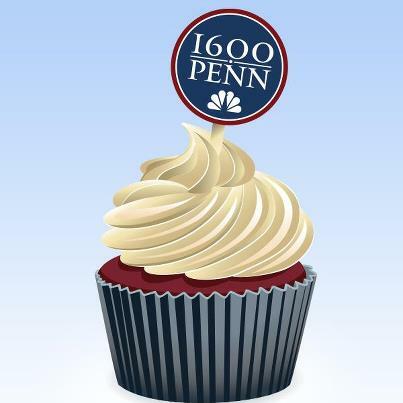 For the network premier of 1600 Penn, NBC teamed with Sprinkles bakery for a social media contest. People who picked up a free cupcake at one of eleven bakery locations had the chance to win a year’s supply of frosted happiness by posting a photo of the cupcake with Instagram or by tweeting a shot with the hashtag #1600Cupcakes. Anyone not living near the physical stores could share a virtual cupcake on their Facebook, Twitter, Instagram, or Tumblr profiles. Laughter and greater audiences – what a delicious combination.